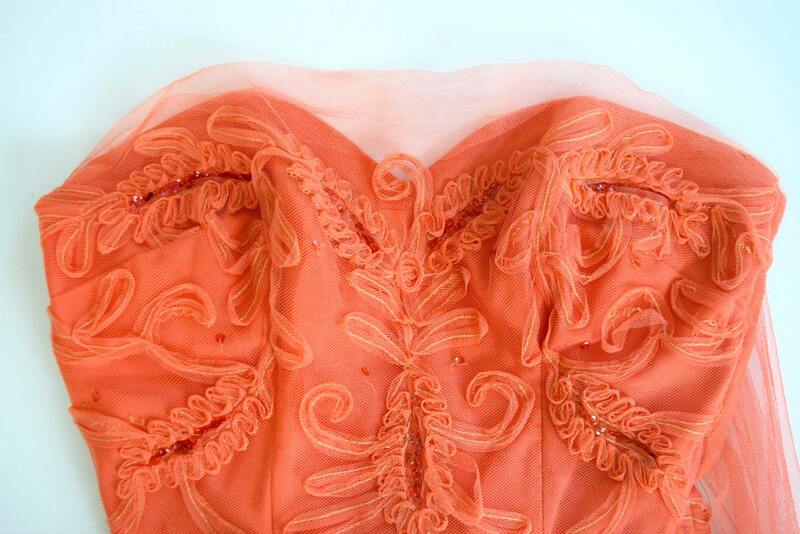 Gorgeous salmon orange new look strapless party dress with mesh tulle overlay and fitted, sequined bodice. Sweetheart neckline. Boned bodice with princess seaming. Attached shawl that can also be wrapped around and tied in the front as a sash belt. Fully lined in coordinating satin. Metal zipper up the side. Condition: There is a tear in the attached shawl that measures about 2.5" long and 1 and 1/4" wide, but is not noticeable if worn wrapped around as a sash (as shown in picture 2). Additionally, a few pieces of tulle trim on the bodice have become loose. Other than that, dress is structurally sound and is completely wearable. These issues have been taken into account when pricing this item.